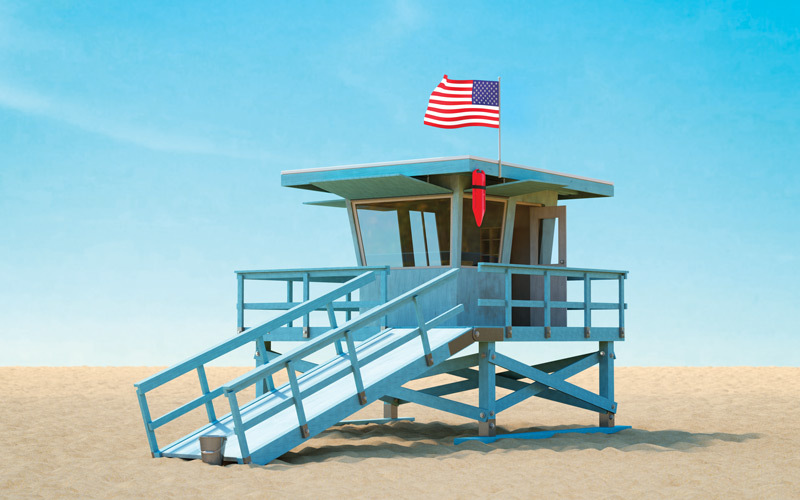 Looking like mini midcentury modern stilt houses or the most seaside of seaside cabins, the 158 lifeguard towers that dot the coastline of Los Angles County are unsung sentinels. Built to shield lifeguards from the glaring sun while also giving them a better view of the beach—and somewhat comfortable quarters—the seemingly simple structures have more going on than meets the eye. Take a closer peek. For many years you could still find roofless towers. Sun-sick lifeguards called them “penalty boxes.” Today’s towers, which are based on models from the 1950s, feature wide eaves and windows that are UV-protected and angled to cut down on sun exposure. A word to the wise: Lifeguards can see more than you think through those windows, says Arthur Verge, who patrolled Santa Monica’s beaches for more than 40 years. The American flag is flown to indicate the tower is occupied. When there are too many swimmers for safe surfing, the blackball flag serves as a warning. If you see a red flotation device—known as a can—attached to the building, the lifeguard is inside, not on the sand or in the water. One of the few pieces of gear permanently stored in a tower is the bucket that lifeguards place at the base of the ramp to wash sand and salt off their feet. They take the high-powered binoculars with them when they leave, folding the tower’s flaps down to protect the angled windows. Before the mid-’70s, there were three lifeguard services: Santa Monica, L.A. City, and L.A. County. Each had different styles of towers. Some were fiberglass, some wood, some big, some small, some painted white, some blue. It wasn’t until 2001 that the now-unified L.A. County lifeguard service adopted a blue wood version as the standard. The towers are elevated to provide a better vantage point, of course, but also to protect against errant waves at high tide. Most of the structures are moved inland via tractor in the winter to avoid storm surges and then out again in the spring. El Niño seasons or varying sea levels from climate change can also mean they have to be repositioned. Previous article5 Major Changes Coming to L.A.